The FT article cited that the share price of iShares Emerging Markets ETF (EEM) fell “to a 6.5 per cent discount to the underlying asset value.” While this figure is partially true, it was mostly reflecting stale data. Remember, most emerging market exchanges are closed during the U.S. trading day! 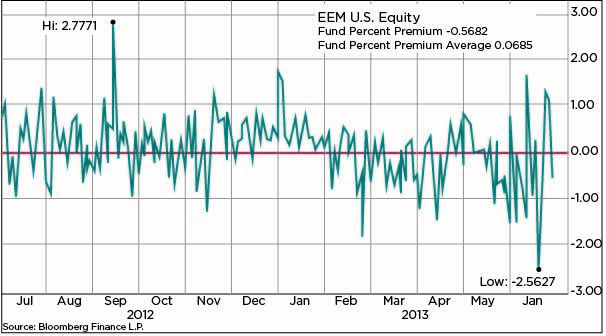 Premiums and discounts occur quite often in emerging market ETFs, as you can see in the chart above. In its simplest form, the discount to NAV was reflecting the market’s future anticipation of the coming sell-off in the emerging market world. Maybe most importantly, the NAV quickly reverted back, and an investor with a time frame of any longer than a week shouldn’t have even taken notice. Outside of Treasuries, many fixed income instruments trade infrequently and prices can be quite stale, particularly in municipal bonds. ETFs provide a price discovery mechanism for many fixed income instruments, and often the price of the ETF itself is more accurate than the underlying NAV! This is because bonds that don’t trade as frequently could be reflecting older prices, and the ETF becomes the primary pricing instrument. The issue here is the bond market, not the ETF market. I would rather sell my fixed income ETF at a discount instead of being unable to sell my Sarpy County Tourism Muni Bond at all. Not to pick on the FT, but they also included this quote in the article: “The losses for ETFs today were far beyond what the most sophisticated financial risk models could have predicted for worst-case scenarios.” Come on now: It seems like the quote may have been taken out of context, but even if not, how can a 1.72 percent drop (fall in MUB ETF referenced in the June 20 article) be considered a worst-case scenario? Maybe someone forgot to update their financial models after 2008. It is important, particularly for many retail investors, to remember that ETFs tracking illiquid securities can face these premiums and discounts in times of large fund flows. However, ETFs have brought massive amounts of liquidity to areas of the market previously non-investable for most. ETFs are working just as designed, even under times of market stress.